Does anyone know where did the Stoßtruppen carry the extra 9mm snail drums for the MP-18? Is it the greenish bag on the front right? (I know it's not in the rations bag on the front left). 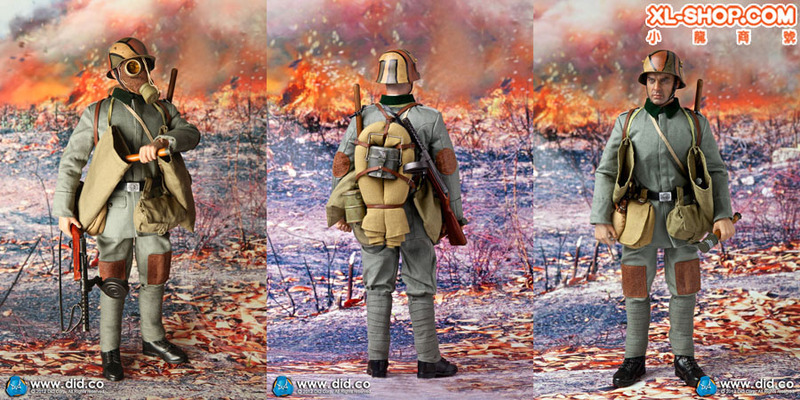 On his waist, the bag on his front left is the old cloth carrier for the M1915 Gummimaske (replaced later by the metal canister he wears on his back left). The bread bag, or "ration's bag" as you call it, is on his waist's front right. It really should be on his back (over the right buttock) because the way he's wearing it on that figure will really restrict his movements. He doesn't actually carry the canva bags for the Luger Trommelmagazin. Realistically he would have just tossed the spare magazines in his grenade backs in exchange for a couple stick grenades less. Wow, thank you for that explanation Mr. Durandal. I always wondered where videogame characters put all their weapons & ammunition.